; Online DEMO version, for evaluation purposes only. You can translate any text within seconds. Service available by SMS and WAP, using any cell phone. Click WAP TRANSLATOR for details! Service available by SMS and WAP, using any cell phone. Click SMS TRANSLATOR for details! This version will only display a rough translation. Below the translation are listed alternative meanings for every word. Select the most suitable word to change the translation to the appropriate meaning. Fully functional on your computer, no Internet connection needed. The 30 word limitation no longer applies. You can translate a few pages at a time. Allowing you to add new senses, words, phrases or idioms. 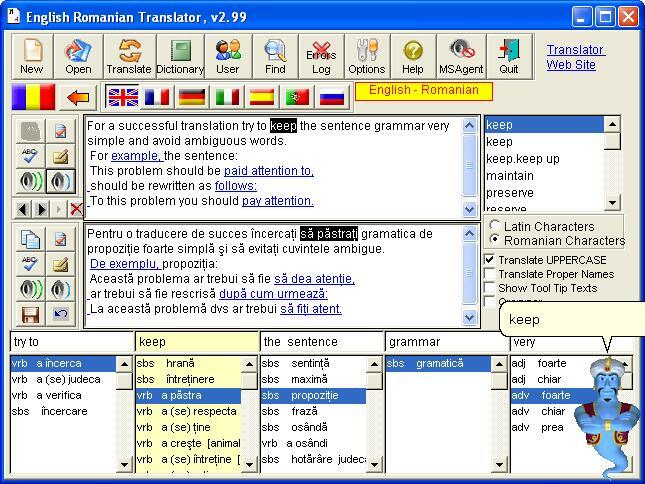 Hear both English and Romanian texts using MSAgent.